Since 2005, Socialcast has been a leader in the development of on-demand collaboration software. 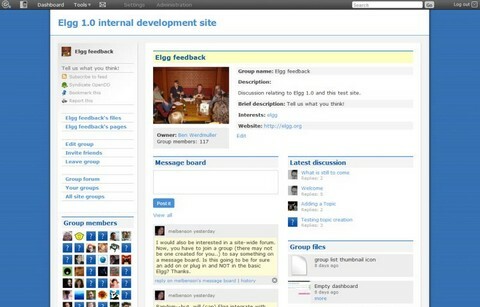 Socialcast unites traditional intranet features with social networking technology to empower employees to expand, create and share knowledge across the enterprise. 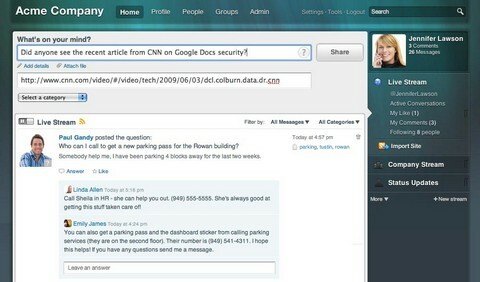 Socialcast is a simple, secure, free collaboration tool that helps employees communicate in real time. Recently, Sociacast has announced that all new corporate networks will be free to join and use for employees and site administrators. Additionally, administration rights for these networks are completely free. Administrators can manage user access and customize the site’s look and feel at no charge. This exciting news opens up access to Socialcast’s Enterprise-ready tool for thousands of organizations across the globe. Socialcast is simple to use for new companies and their employees, and at the same time provides a robust, useful and customized experience for companies that may be using other free tools on the market. After the success of Blogging Icons, Blog Perfume has just released Social Media Icons Pack which comes in really handy when integrating social media sites to your blog. Social Media Icons Pack includes 3 sizes for 17 icons: 128×128, 64×64 and 32×32. There is an icon for the following: Blogger, Delicious, DesignFloat, Digg, Facebook, Flickr, Google, a heart icon that will work for anything (such as bookmark), MySpace, Reddit, an RSS icon, StumbleUpon, Technorati, Twitter, WordPress, Yahoo! and YouTube. These icons are released under Creative Commons Attribution 3.0 License. You are free to use them on both personal and commercial projects. Fire Eagle is a new service designed to make it safe and easy to build and use location-aware applications and services. It’s a place where users can store and manage information about their current location that trusted apps and sites can update or access. Want to make your website or mobile application more relevant or responsive to a user’s location? Or maybe you’ve found a way to capture user location and want to find cool uses for this info? By doing the heavy lifting for you and connecting you to a community of geo-developers, Fire Eagle makes it easier to build location-aware services. And Fire Eagle is completely free to use. Shout’Em is platform on which you can easily start co-branded microbloging social networking service. Something simple as Twitter or with more features like Pownce. Networks on Shout’Em are “lightweight social networks”. They have small set of features: microblogging, links and photo sharing, geo location sharing and mobile browser support. Shout’Em is the service that want’s to make your job that much easier. With features such as posting links, photos as well as geolocating and mobile interfaces, it’s the easiest way to get your own microblogging service up and running. This lets bloggers and small companies get back to what’s important – creating value, while letting Shout’Em do all the hard (technical) work. Scalable, they’ve made sure of it. Anybody can use Shout’Em. From single person building up a community for his friends, to large corporations providing nice new service to their existing user base. Use the invitation code “doneright” to register and create your own social network now. Cocomo is a Platform as a Service that allows Flex developers to easily add real-time social capabilities into their RIA (rich Internet applications). Comprised of both Flex-based client components and a hosted services infrastructure, Cocomo allows you to build real-time, multi-user applications with Flex in less time than ever before. And because Acrobat.com hosts the service, issues like deployment, maintenance, and scalability are taken care of for you. Features of the Cocomo beta includes, VoIP Audio, Webcam Video, Chat, Multi-User Whiteboards, Real-Time File Sharing, User Management, Roles and Permissions and Robust Data Messaging. To get access to the public beta of Cocomo service and Cocomo SDK, you just need to create a developer account in Adobe. What do you to do if you want readers to promote your content? Encourage your visitors to submit their favorite stories directly to Digg? Not everyone uses Digg. You have to decide on which bookmarking site, if any, to dedicate your precious screen real-estate. It’s a hard choice. If you choose poorly your reader won’t vote—it’s not a single click coupled and out-of-sight means out-of-mind—and your content losses its chance to make it big. You have to choose your horse wisely. On the other hand, if you take the bird-shot approach, it overloads your reader with branded badge after branded badge. It turns your page into the village bicycle. Not pretty. Nobody seems to have solved the problem yet. If you could detect which social bookmarking sites your reader uses, on a per-reader basis, you could display only the badges they care about. SocialHistory.js enables you to detect which social bookmarking sites your visitors use. SocialHistory.js has a big list of the most popular social bookmarking sites which it checks against. Elgg is an open, flexible social networking engine, designed to run at the heart of any socially-aware application. Building on Elgg is easy, and because the engine handles common web application and social functionality for you, you can concentrate on developing your idea. It runs on Apache, PHP and MySQL – the same open source platform that the majority of web applications are written in. Elgg is compatible with enterprise technologies like the Zend Platform and any server environment that can run the Apache web server. Elgg supports technologies like OpenDD, OpenID and OpenSocial, and they are directly involved in community efforts to push the envelope when it comes to data portability, federation and the user experience. Elgg is a great way to future-proof your social applications. 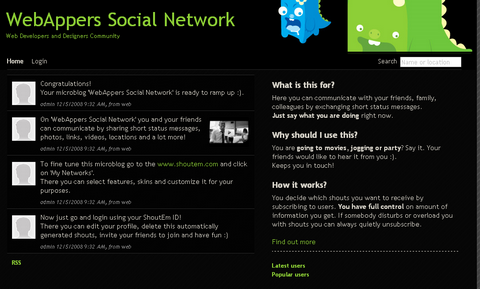 You can also look at other Open Source Social Network Platform we have mentioned few months ago. I am sure you can find the one which is suitable for you to start your own social network site.